Daffodils are blooming, the days are finally getting longer, and eggs are appearing in all form all over the county (Marmite flavoured chocolate anyone?). It can only mean one thing - Easter is finally here! 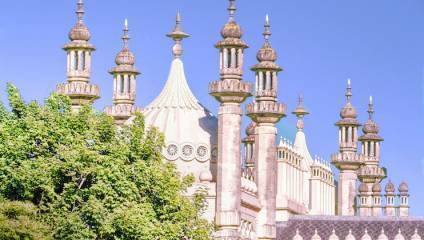 Brighton is the place to be this school break, so get cracking (see what we did there) and check out this ultimate guide to Easter egg holiday fun. Easter rabbits have gone rogue this year in Brighton, and we’ve got both shark and dinosaur eggs to find before they hatch. At Sea Life you can join the Jawsome Sharks on their quest to find missing shark teeth and become the newest recruits of the Jawsome Rangers, and for Easter there’ll be a variety of lost shark eggs scattered across the aquarium and chocolatey treats for those who find them all. Glow in the dark golf Dinosaurs at Globalls are nursing their baby dino-eggs before they hatch in April. However, there are tons of classic Easter egg hunts around and about for those of you with more traditional Easter values. Over at Borde Hill Garden Hetty the Hen has laid 10 golden eggs and hidden them for you to find. Join Bertram Bunny in finding them before Felix the Fox tucks in for himself, or head down to Yellowave beach for their free Easter trial, and find all the Easter pictures to claim a prize. For older kids, there’s no reason to stop learning whilst school’s out. Brighton’s Wakehurst has a Horrible Science experience from 6-22 April, where kids can learn about horrible plants, bug-eating monsters and weeds in stink plant workshops and wicked weed trails. Brighton Museum is hosting a range of Explore Our World events, encouraging families to explore the natural world with pop-up storytelling, creative activities and characters galore, and Hove Museum is holding three Easter arts and crafts days for those more artistically inclined kids. Forecasted rain all week? Brighton is hosting lots of kid-friendly theatre performances over the holidays. Sourpuss at Komedia is a wonderfully elegant display of traditional puppeteering, centred around a very grumpy ginger cat. Suitable for kids aged 3-8 and small babies get in for free, these two lovely matinee shows are a great way to get the family out of the house. More puppets appear at Brighton Dome with The Goose Who Flew, a charming story filled with an assortment of characters. And regardless of whether you have kids to care for or not, everyone should be excited over the Dome’s Pixar In Concert, featuring music from Toy Story, Ratatouille, A Bug’s Life, Monsters Inc and Cars (to name a few). These classic scores played by a full orchestra makes for the perfect night out for kids and grown-ups alike. Already sick of chocolate? Brighton’s restaurants and bars have plenty of foodie plans lined up for your bank holiday weekend. The Hilton Brighton Metropole are offering their famous Sunday carvery accompanied by a live Jazz band, whilst Ashdown Park is offering celebratory three-course luncheons on both Good Friday and Easer Sunday. They’re also holding an Easter Chocolate Afternoon Tea for those of you who aren’t quite chocolated out yet. Fancy a liquid lunch instead? The Bolney Estate is offering child-friendly tours of the vineyard, featuring Easter activity packs and Easter eggs, and their brunch menu may be the only place you can get a Crème Scotch Egg! For more info head to Visit Brighton.